Does anyone know the name of the weave in the picture? I haven't got a clue, but as soon as my hand heals, I need to make myself one. I suspect it has no name, aside from the name the person who makes it gave it... A mixture of wire and rings... Very simple, yet stunning. Very cool looking wire weave and much like DL I'd like to make one, as for a name I have no idea. No rings there, just woven wire. It has double looped sections that look like rings but they are just loops. The backside (inner side) shows the end of the loop leading off down the middle of the bracelet instead of connecting to itself like a ring would. I am curious about how the tips are fashioned. The wire looks pressed or formed with nice round end caps. I read that the tips were Tig welded. Perhaps you could link us to where this was found? Google supports searching via images. It works surprisingly well for some stuff. 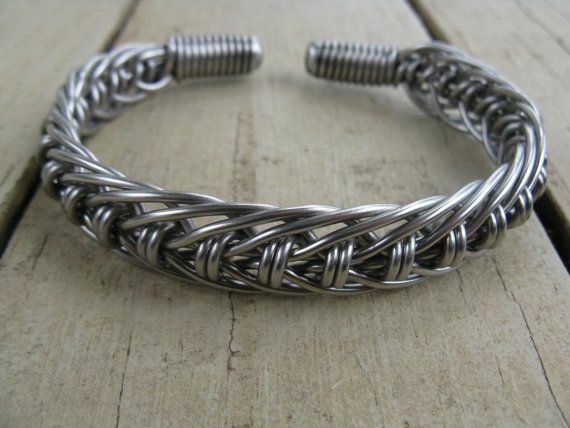 It looks like a sinnet type weave fairly common for paracord type bracelets. Google can do a decent reverse image search under the "advanced search" options. Lorna damewood does a lot of work with wire knots and such. He may know more about the work. If your local library has a copy of Ashley's book of knots you may find something similar. I saw something like that the other day. I don't recall it having a name, but it is pretty cool. I do some paracord stuff too, but I have not seen this weave in cord ... not to say it is not out there, I just do not know of it. Loren Damewood is Goldenknots here on MAIL. He works mainly in Turk's Head knots. It's always better to let people know where an image came from. That way we know who it belongs to and there are fewer copyright worries. Although in this case, it looks like it's hard to tell where this image originally came from (maybe an Etsy store?) since most people who copied it neglected to say where it came from. A shame since it is very pretty. Today at lunch I did a test weave. The image doesn't show up for me directly but I can copy and paste the link to the address bar to get to Dropbox. Looks like a step in the right direction. The original, it seems like the most details are from said Etsy shop. Somewhere it indicated it was 10 strands of welding welding wire with welded tips but not much more than that. What you've made is certainly similar but it looks like you're only using 5 strands and your loops are tight vs being flared. I'm going to guess that the original creator used a jig to keep the edge loops flaring gradually outwards then turning back inwards on a much greater angle (from left to right). I don't expect many people could weave that sized (presuming 16g) stainless wire that cleanly without a jig. If I'm visualizing things correctly the jig could be as simple as two or four headless nails with the appropriate space between them.